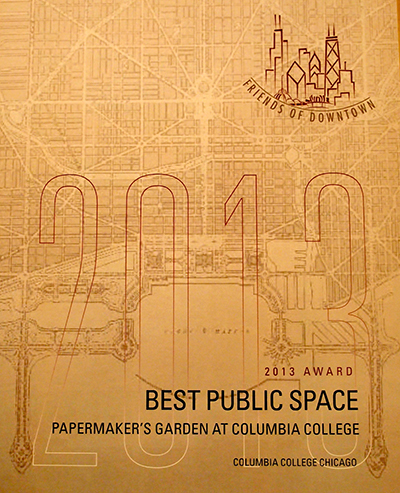 The Center for Book and Paper Arts staff member April Sheridan (Studio Technician and Special Projects Coordinator) was in attendance to receive the Friends of Downtown 2013 “Best Public Space” award for the Papermaker’s Garden. 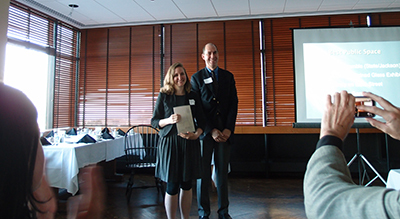 The ceremony took place at the Cliff Dweller’s club on Tuesday, June 3. This award shows that the Garden has been recognized by the public as an important site for community dialogue about interdisciplinary arts. April Sheridan, Studio Technician and Special Projects Coordinator for the Center for Book & Paper Arts, at the end of her superb acceptance speech on behalf of all those who have contributed to the success of the Papermaker’s Garden. The Papermaker’s Garden features a variety of plants grown to be used as papermaking fiber and art material in the Center for Book & Paper studios. This garden supports deep hands on engagement with the process of fiber production as well contemporary ideas in interdisciplinary practice related to art, science, the environment and social practice. Friends of Downtown, founded in 1981, focuses on intelligent planning and urban design for downtown Chicago, and directly influences planning and development decisions through debate, public advocacy, and cooperation with other civic organizations.